With summertime schedules, work, and mini quilt swaps on Instagram, I haven’t had a chance to update my blog for a while! However, today I have a special treat for you! I’m participating in the Pets on Quilts contest sponsored by Lily Pad Quilting. 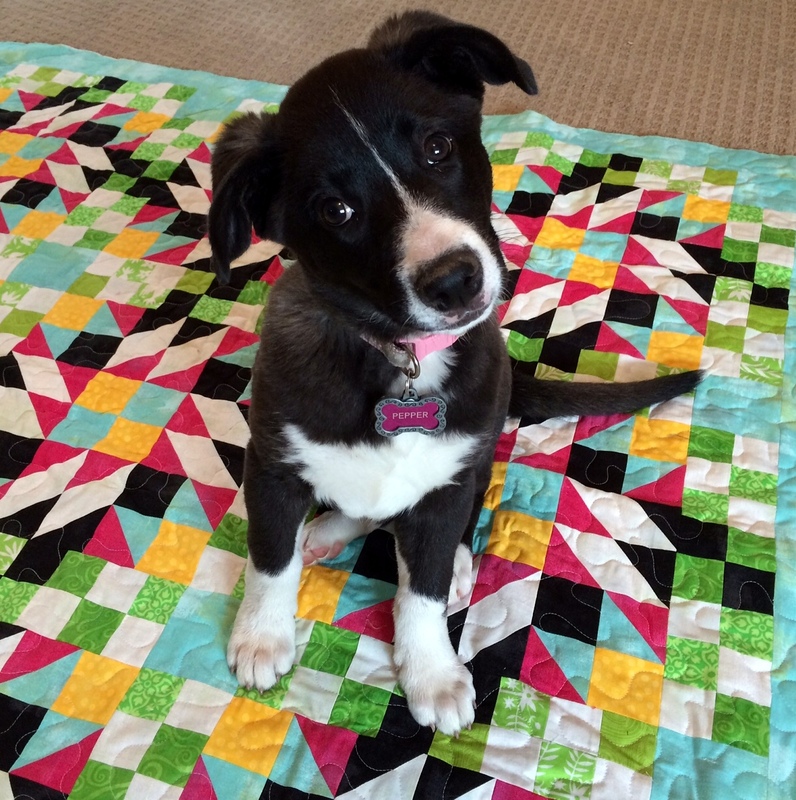 My entry features my little puppy, Pepper, sitting prettily on my Grand Illusion Mystery quilt. This quilt is designed by the fabulous Bonnie Hunter as her mystery quilt for last year. I’m entering the “Pup on Quilt” category. In this photo, Pepper is about 10 weeks old. Don’t you just love her cute little ears?! I made my Grand Illusion Mystery quilt using green scraps from my stash and Moda Grunges for the solids. It is a lap-sized quilt so perfectly sized for cuddling on the couch with a pup or cat! You can check out all the other wonderful entries in the Pets on Quilts contest in the linky party here. This entry was posted in Dogs, Events, Moda, Mystery Quilt, Quilts and tagged Grand Illusion Mystery quilt, Lily Pad Quilting, Moda Grunge, Pepper, pet contest, Pets on Quilts by thequiltedcat. Bookmark the permalink. Pepper is adorable and very striking on your GI! I love Bonnie and all of her quilts too. Looking forward to her next mystery. Pepper is adorable!!! Love the colours in your quilt and the pattern is lovely!! Pepper is so cute. What a gorgeous face! You did well to get her to sit still to get the photo. Love the head tilt – trying to figure out what that thing you are pointing at her is – so cute! Pepper is adorable. He looks great on all that fun color! Pepper seems to be looking at you like, “mom, what are you doing?” What an absolute sweetie. And I love the colors on your quilt. I love your Pepper puppy and your Grand Illusion quilt! A really pretty combination. Pepper is a real cutie! Oh my goodness…what a face! Pepper is adorable. The quilt is beautiful, and the dog is a darling pup. I really like the colors! I would’ve never chose those on my own & really like them! Don’t you just love that little head tilt that pups give you? I just wanna cuddle her & get some puppy kisses! Her ears, her face, the look, I love everything about her. Pepper – you are such a cutie! What a star model you are on the quilt! What a cutie!! We used to have a dog named Pepper, too! Hi Jennifer! Pepper is soooo Sweet! That is an adoring look if I ever saw one. Your Grand Illusion looks amazing! What a cutie pie!! He works so well with the color of the Illusion quilt.